. Ready to provide years of entertainment, pride and joy. This ski boat is located near Brasher Falls, NY (zip 13613). I trailered this boat from freshwater Maryland to Upstate NY without any problems. It still throws that unmistakable Nautique soft wake. The wake is amazing at shortline (28 off and shorter), and it's amazing for wakeboarders or wake surfing. You can see it's actual wake in my photos. Want more pictures? Just ask! The teak ski deck is in great shape, feels solid. The hull is in great shape, very little spider cracking normally associated with typical age. The engine runs well, is easy to work on. Starts hard when cold. Holds 34 or 36 mph as if it was new. New snap-on hand-made travel cover. Refurbished trailer, packed bearings, etc. Removed wood from boat floor, replaced with fiberglass stringers. Airguides work but pitots are somewhat plugged, easily fixed or ignored (I used GPS). Old style pylon ring and finger re-attached yet easily removed for skylons. Comes with (or without) Boom for waterski training and barefooting (see video http://www.youtube.com/watch?v=L3fFoiwBfOA). Ready to provide years of entertainment, pride and joy. 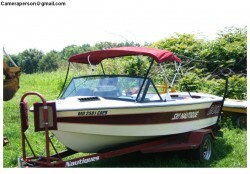 This ski boat is located near Brasher Falls, NY (zip 13613). I trailered this boat from freshwater Maryland to Upstate NY without any problems. I've added a lot of value to this boat, cleaned it up and added nice features like the hose attachment for easy winterizing, the ring pylon etc, and new flooring. It still throws that unmistakable Nautique launch wake.